The Arab world has significantly influenced various fields, notably the arts and architecture, philosophy, ethics, literature and business, in both the ancient and the contemporary world. Arabs are generally known for their generosity, hospitality and also their ambition and competitiveness. What Arab would not aspire to surpass the world in something? The world has seen many Arabic numbers in Guinness World Records over the years, especially in the field of architecture and construction. Since ancient times, Arabs have believed in leaving their mark on the world in the form of brilliant structures. And the phenomenon goes on. Let’s take a look on some Arabic numbers that made history, Arab structures that broke Guinness World Records over the years. 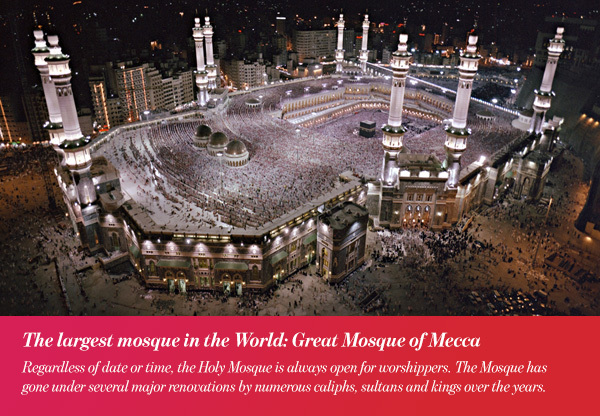 Regardless of date or time, the Holy Mosque is always open for worshippers. The Mosque has gone under several major renovations by numerous caliphs, sultans and kings over the years. The latest extension project started in 2007; it is set to be completed in 2020. This expansion aims to increase the mosque’s capacity to 2.5 million worshippers when it is done. The area of the mosque will be expanded from the current 356,000 square meters to 400,000 square meters, with the addition of two new minarets, bringing their total to eleven. There was an estimation in 2016 that said building the Great Mosque with all the following expansions had cost around 100 billion dollars over the years. A short walking distance away from the world’s largest mosque lies our next Arabic record, Abraj Al Bait. The name of this hotel complex Abraj Al-Bait means The Towers of the House, of course the house here refers to The Holy Mosque. It is a complex of seven skyscraper hotels in Mecca, which is fully owned by the Saudi government. Makkah Royal Clock Tower, A Fairmont Hotel, which is the central hotel tower, is the world’s tallest clock tower; it also features the world’s largest clock face. Earning the status of the world’s most expensive building, the total cost of constructing this skyscraper which is the fourth tallest building and fifth tallest freestanding structure in the world was US$15 billion. This hotel has certainly accomplished a lot of Arabic numbers in Guinness world records all by itself. Interestingly, the developer and contractor of Abraj Al Bait is the Saudi Binladin Group, which is the Kingdom’s largest construction company. According to Guinness world records, The Dubai Mall is the largest mall in the world by total area. And this massive mall includes 1,200 shops., what a marvelous shopping experience it provides! Attracting over 54 million visitors each year, Dubai mall was the most visited building in the planet in 2011. With about 1000 retailers, Dubai Mall opened in 2008 marking the world’s second largest mall opening in the history of retail. Now the growing number of shops ha sreached more than 1200 retail shops. The total area of the humongous mall is around 13 million square foot and the total internal floor area is 5.9 million square feet. This massive development also houses a luxury hotel, 22 cinema screens and more than 120 restaurants and cafes. It is also home to the Dubai Aquarium and Underwater Zoo which features the World’s largest acrylic panel. Moreover, Dubai mall includes the world’s largest sweet shop, “Candylicious”, spreading over an area of 930 square meters, and what a sweet record that is! The eternally buzzing Dubai is determined to add new Arabic numbers in Guinness world records each year! Dubai’s already impressive skyline keeps on changing with new world records everyday! Standing tall at 355.35 meters from ground level to the top of its mast, and adding another landmark to Dubai’s impressive skyline, the JW Marriott Marquis Dubai is the tallest hotel in the world. The hotel was formerly known as Emirates Park Towers Hotel & Spa, it consists of two 77-storey twin towers. Featuring 806 rooms, the first tower has opened in 2012. The whole development is set to provide 1,608 rooms, over 8,000 square meters of indoor and outdoor event space, four Presidential suites, a banquet hall, an auditorium, Shops, Restaurants and cafes, as well as a premium spa. Al Hassan Al Thani Mosque is the largest mosque in Morocco and the 13th largest mosque in the world. It can accommodate a total of 105,000 worshippers for prayers. The minaret of the mosque, which is 60 stories high, is the tallest minaret in the world. 210 meters high, the minaret was completed in 1993. It is the tallest religious structure in the world. The four faces of the square minaret feature carved embellishment with diverse materials. Green tiles decorate the minaret for one third of the height from the top, and then changes color to deep green or turquoise blue, a color pallet befitting an beachfront mosque. The mosque stands on a cliff overlooking the Atlantic Ocean and worshipers can pray over the sea. The mosque itself is an architectural wonder with walls of hand-crafted marble and a retractable roof. This mosques with its minaret is not just remarkable for its peculiar design but also for its incredible beauty, a great example of Arabic architecture. The Pyramid of Khufu, also known as The Great Pyramid of Giza is the oldest and the largest of the three pyramids in the Giza pyramid complex; it is also the tallest pyramid in the world. The pyramid is the oldest of the Seven Wonders of the Ancient World as well, and the only one of them to remain largely intact to this day and age. The Great Pyramid has been the tallest man-made structure in the world for more than 3,800 years. It was originally 146.5 meters high and covered by casing stones that formed a smooth facade. Today we can only see the underlying core structure. Yet, some of the casing stones can still be seen around the base. 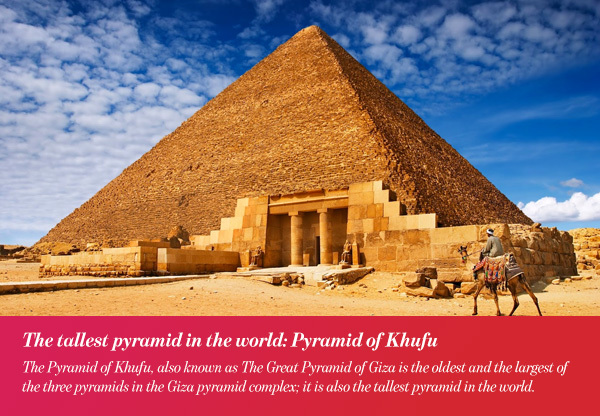 The pyramid of Khufu is also the oldest Arabic number in Guinness world records!